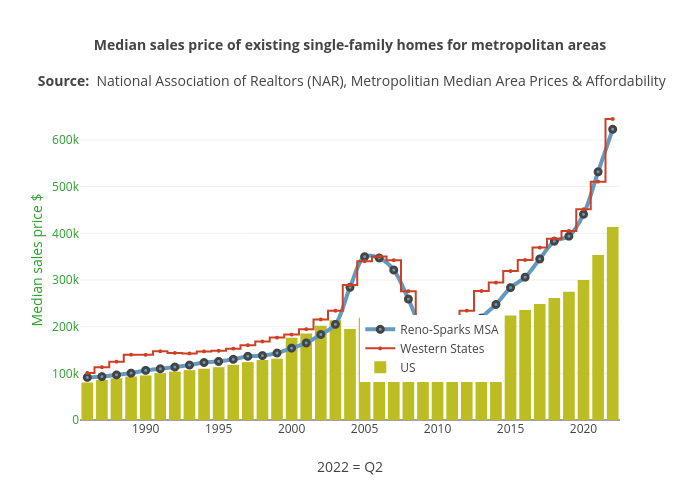 Truckeemeadowstomorrow's interactive graph and data of "Median sales price of existing single-family homes for metropolitan areas" is a line chart, showing Reno-Sparks MSA, Western States, US; with 2018 = Q2 in the x-axis and Median sales price $ in the y-axis.. The x-axis shows values from 1984.1149203283437 to 2019.8850796716563. The y-axis shows values from 0 to 427156.80766688695.